(Newser) – At 7 years old, Naomi Vaughan probably has a hard time wrapping her head around a 65 million-year span. But that's the minimum amount of time elapsed between the death of a tiny sea creature and when Naomi picked up its remains. 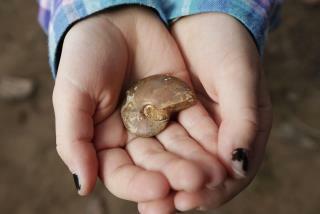 Bored with her sister's soccer game in Bend, Ore., last fall, Naomi started digging in the dirt and found what she thought was a shiny rock resembling the spiral-shaped amulet featured in Disney's Moana. Spotting its pearlescence, her mother suspected the "Moana rock" was actually something more, perhaps "millions of years old." Earlier this month, her suspicions were confirmed when paleontologists revealed the rock was actually a fossil of a marine invertebrate called an ammonite, which went extinct some 65 million years ago. And the fossil still in office : Feinsteinonite . Forget dollar value, that is a nice find.